The Wild Atlantic Way shouldn’t be viewed as just a scenic route alone but a portal into the history and heritage of the places it travels through. In this post, I examine famous Kerry people with connections to the Wild Atlantic Way route in the county. I’ve limited it to five for brevity sake and the selection is a combination of people who achieved extraordinary feats and/or who’ve had an influence on my own life. The list runs from north to south. John B Keane was born in Listowel in 1928 and worked in a number of jobs both in Ireland and the UK prior to running his own pub in 1955. Regardless of job, the constant in his life was his writing and in 1959, the Listowel Drama Group performed his first play, Sive, which won Best Play at the All-Ireland Drama Festival in the same year. It was a pivotal moment in the Irish arts scene as it was an honest and often humorous exploration of the social issues facing rural Ireland of the day through the timeless themes of love, loneliness and poverty. Sive was the first full-length play I saw on stage and such was the emotional impact it still remains my favourite stage production beating a West End viewing of Phantom of the Opera into second place. John B became one of Ireland’ most prolific playwrights and novelists, and was a favoured guest on radio and television shows for his engaging stories and philosophy of common sense. His play, The Field, was made into a film starring Richard Harris, Brenda Fricker and John Hurt. He won numerous awards and received honorary doctorates for his contribution to the arts. He co-founded Listowel Writers’ Week, Ireland’s premier literary gathering. His observations and insight into the human condition along with his articulation of the truth through his art has been a huge influence on me which is why I chose to include John B in this list over other Kerry writers. He died in 2002 leaving a bulk of literary gems behind. The B in his name was Brendan which brings me nicely to my next noted Kerry person. St. Brendan was born in the Fenit area, north of Tralee, in 484. His early education was provided by St. Ide but his seafaring and boat-building skills were honed at the monastic school run by Bishop Erc, the Bishop who later ordained Brendan. St. Brendan travelled extensively around Ireland but his first major sea voyage was to the Outer Hebrides, the Faroe and Shetland Islands as well as Iceland. However, it was the seven year voyage he and other monks undertook in the early 6th century that he is most famed for. Setting sail in a self-made boat of leather and wood from Brandon Creek on the Dingle Peninsula, it is widely believed that St. Brendan and his group of monks discovered America given the evidence written in the Navigatio Brendani (Voyage of Brendan), a manuscript detailing his adventures. In 1976 British explorer and historian Tim Severin re-traced St. Brendan’s journey in a replica boat as per the Navigatio proving that it was physically possible to traverse the Atlantic in such a vessel. More and more evidence is coming to light to prove that St. Brendan reached America several hundred years before Christopher Columbus. In 2011, evidence of a 1521 report by Spanish historian Peter Martyr d’Anghiera includes a description of a colony of tall grey-eyed European-like people, the Duhare, in the areas that are now the Carolinas and Georgia. It is alleged that Christopher Columbus researched the Navigatio Brendani prior to his 1492 voyage. St. Brendan died in 577 leaving a legacy of monastic settlements and stories which historians and travellers still discuss to this day. A farmer’s son from Annascaul on the Dingle Peninsula, Tom Crean was born in 1877 and enlisted into the British Royal Navy at the age of fifteen, lying about his age in order to be submitted. While serving on a naval vessel in New Zealand in 1901 he volunteered to join Robert Scott’s Discovery expedition to the South Pole. He re-joined Scott on the Terra Nova Antarctic expedition of 1910 and was awarded the Albert Medal along with William Lashly for the courage shown in saving Lt. Teddy Evans in physically and mentally challenging circumstances. This experience didn’t discourage Crean as he was selected by Sir Ernest Shackleton for the 1914 Imperial Trans-Antarctic Expedition on board the Endurance which became stuck in ice in early 1915. Crean was amongst Shackleton’s group which trekked hundreds of miles across packed ice and sailed over a thousand miles in lifeboats, first to Elephant Island and then to South Georgia in some of the toughest sea conditions ever experienced. It is said that Crean’s physical and mental strength, along with his seamanship and good humour added greatly to all three polar expeditions. 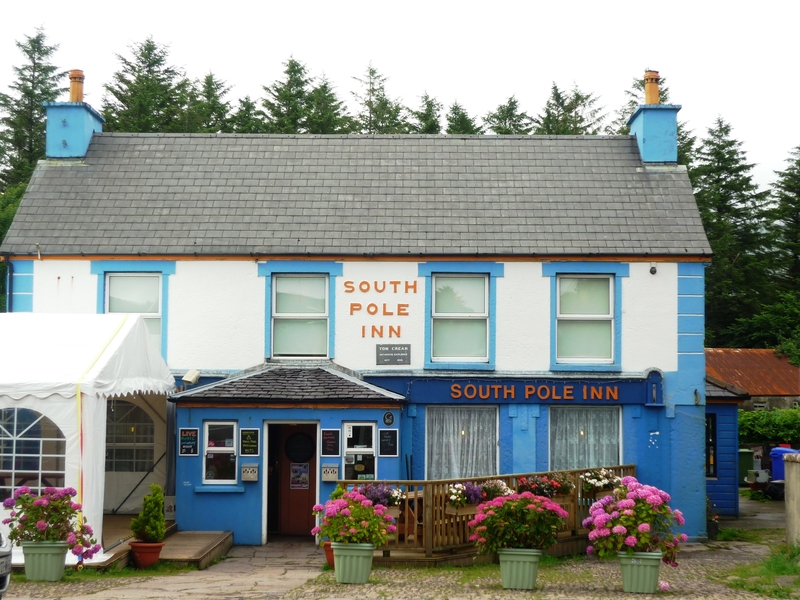 In 1920, he retired from the British Navy on medical grounds and returned to Annascaul with his wife and children to run a pub which he called “The South Pole Inn”. His reluctance to speak of his achievements was due possibly to the prevailing republicanism in Ireland at the time, which rejected all things British, rather than Crean’s own modesty. As a result, his feats have never been officially recognised and most people had never heard of him until the publication of Michael Smith’s biography, An Unsung Hero, in 2000. Tom Crean died in 1938 from an infection caused by a delay in treating a burst appendix. Out of my list of brave and brilliant Kerry people, Monsignor Hugh O’Flaherty is the only one to have a film made out of his exploits, that being the 1983 production The Scarlet and the Black with Gregory Peck playing the title role. Born in 1898 in his mother’s native Cork, the Monsignor grew up in Killarney where his father worked at the Golf Club instilling a lifelong love of the sport in the young Hugh, an interest which served him well in diplomatic circles later in life. He was ordained in 1925 and served in Egypt, Haiti, San Domingo and Czechoslovakia for four years before returning to the Vatican. In 1934 he was appointed Monsignor. Witnessing the widespread anti-Semitism around Rome in 1942, the Monsignor arranged for the Jewish community to be hidden in Catholic Church properties. When German forces occupied Rome in 1943, Monsignor O’Flaherty extended his operation to include Allied servicemen. His actions came to the attention of Nazi Commander Herbert Kappler who ordered the capture of the Monsignor should he step outside Vatican grounds. O’Flaherty defied and duped the Nazis by travelling throughout Rome in a variety of disguises. By the end of World War II it is believed that the Monsignor helped 6,500 Jews and Allied servicemen escape the clutches of the Third Reich. For his bravery, he was honoured by several countries, receiving the US Medal of Freedom and made a Commander of the British Empire. In 1960, he retired to Cahersiveen due to ill-health and lived with his sister until his death in 1963. He is buried near the main entrance of the Daniel O’Connell Memorial Church in Cahersiveen. 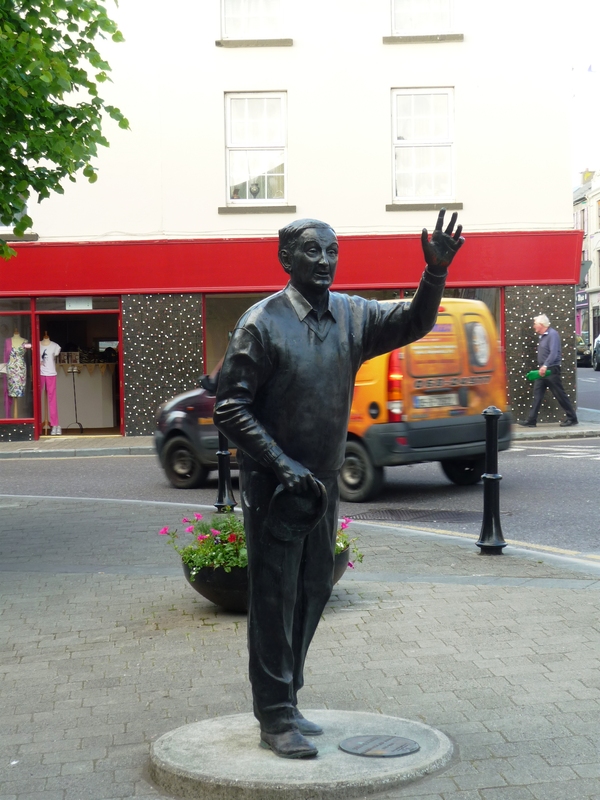 Like Tom Crean, the Monsignor has never had official state recognition for his achievements although, in Killarney, a memorial and mural celebrate his life as does the annual Hugh O’ Flaherty Memorial Weekend held in October/November. Daniel O’Connell was born in Cahersiveen in 1775 and was schooled in France, with his wealthy uncle Maurice “Hunting Cap” O’Connell in Derrynane acting as benefactor. Whilst in France he witnessed the French Revolution. Appalled by its violence he adopted a pacifist approach to Ireland’s struggle for freedom from the British. He trained and worked as a Barrister gaining a reputation as an eloquent yet fierce adversary. He became involved in politics and campaigned for the betterment of Irish Catholics, most notably Catholic Emancipation which would allow Catholics to become members of parliament. In 1828, O’Connell was elected to the British Parliament for the County Clare constituency but was unable to take his seat as the Emancipation Act was not retrospective. Another election was held with O’Connell topping the poll. O’Connell acquired the name “The Liberator” for this achievement and continued legal work and political campaigning. His desire for a separate parliament in Ireland (Repeal of the Union with Westminster) was a step too far for the British and he was imprisoned for such a campaign. He died in Genoa in 1847 on route to Rome with his heart buried in the Italian capital and the remainder of his body interred in Glasnevin Cemetary, Dublin, the non-denominational burial ground which O’Connell campaigned to establish. His non-violent methods have inspired leaders and humanitarians around the world including Gandhi, Martin Luther King and US anti-slave reformer Frederick Douglass, whom O’Connell became acquainted with. The Daniel O’Connell Memorial Church in his native Cahersiveen is the only Catholic Church in the world to be dedicated to a lay person. Derrynane House, O’Connell’s home, is now opened as a National Historic Park. 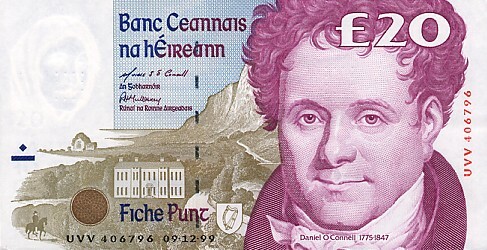 Daniel O’Connell, the only one of my five to be featured on Irish currency gracing the £20 note prior to the Euro. All five on my list of famous Kerry people have lived outside of Ireland at some stage of their lives which raises the question as to whether time away from Ireland is the best way of understanding it. But it’s the courage, honesty and leadership which all five displayed in the achievement of their feats, traits which are sadly seen as impediments to success nowadays. The ability of the above five to take action and inspire others only highlights the weakness in character of modern life’s procrastinators and self-serving yes men. If role models are needed to reverse this trend then look no further than John B, Tom, Brendan, Hugh and Daniel. I hope this blog post is informative and entertaining. But most of all I hope my choices and conclusion encourage debate. So let the courage and honesty begin. Kerry destinations are covered in my Places to Visit in Kerry post. My Kerry, Ireland Travel Guide post lists all the essential travel details for the county. It’s actually a nicce and helpful piece of info. Thanks Jobs. I wrote it with an international audience in mind, keeping to the salient points, although a lot of Irish people wouldn’t be familiar with all five, Monsignor O’Flaherty in particular. Feel free to follow my blog. Thanks for your lovely comment. No developer involved here. Just my own imagination, WordPress technology and an obsession with the various hues of purple. Thanks for your lovely comments, phen. I hope you enjoy my next post – it comes with equally strong comments, this time about Bosnian politics. Thanks for your kind comments, money. I’m delighted to hear you’re reading my blog posts during work! Way to go.